Ebonyi State University, EBSU post UTME result for the 2017/2018 academic session is out. Candidates that participated in the Ebonyi State University post UTME screening exercise can now check their scores. 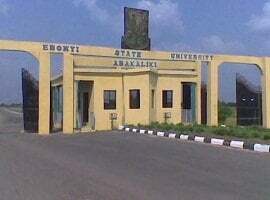 This is to inform all the candidates that participated in the Ebonyi State University (EBSU) Post UTME screening exercise that the management of the institution has announced the release of their results. Check EBSU Post UTME Result. Take the invoice to any of the Banks listed on your invoice to make payment. After payment, you will be given a token. Return back to this page (http://portal.ebsu-edu.net/AdmissionScreeningResultChecking/AdmissionScreeningResult.aspx) and enter your JAMB Registration number and your Etranzact Confirmation Order Number obtained from the bank to print your Screening Result Slip. NB – Kindly make sure that the details on your invoice is yours before making payment. when should we’ be expecting admmission for 2017/2018 seassion? Upload in progress, please check back later. I want to know if anyone has seen his/her own. The post utme is over what?? 400?? @Evans, you can send someone in Ebonyi. Is fuam post ume result out? @idoko daniel, not yet out currently.